Calm, artistic story telling. Much more than a build. I love this video style as it feels like I’m listening to a story rather than simply “seeing what’s going on.” I’m looking forward to the rest of this tool cabinet. Another great episode in this series. If you’ve never experienced a conversation with someone wielding that thick of a southern accent it can be difficult at times. This time he’s in Iron City, Georgia. Lots of little interesting tidbits in this one. Regardless of how safe you think you are being, how long you’ve been using a saw, or what saw you have it never hurts to reintroduce this information. If you’re just starting in woodworking and watch this video and soak up as much info as you can. Great engineering and thinking, as always, from Andrew. I can’t even count the number of times something like this would have been handy on my S-10. Robots and AI are taking over our world. Sometimes it’s the simple designs that make a large impact. I was really drawn to the water ripple effect of this piece. Simple yet beautiful and eye catching. Now this is some great thinking. 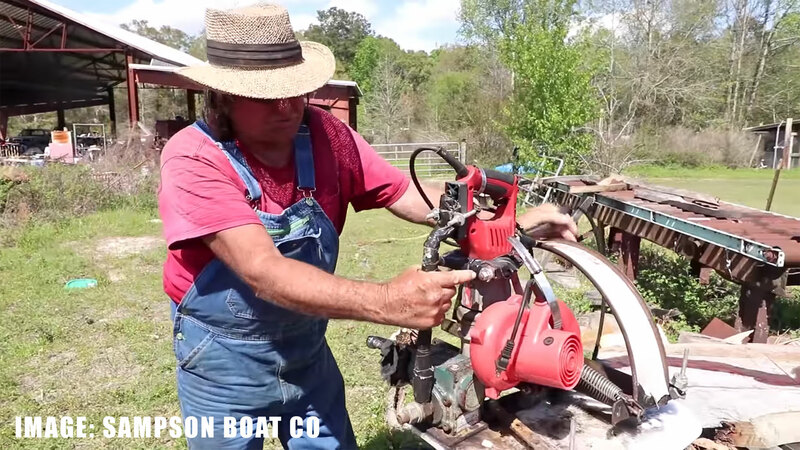 A homemade metal cutoff saw from an angle grinder. Very well executed as well. The complete creation of a quality in-house product made possible by the advancement of technology to bring small scale manufacturing (CNC) to small businesses. That sounds like a mouthfull but it pretty much sums it up. These notepads look so nice. Another great episode off the grid. A great work ethic is highlighted in all of the videos on this channel. Also, remember to be safe when working alone. There’s a few overhead heavy lifting situations that can get sketchy real quick when you’re by yourself. The simplest router circle jig just as he says it. Nothing more to say. I’ll be making one of these soon. An automatic load sensing switch is something that nearly all of us can benefit from. It doesn’t look that difficult to make as well. Geothermal energy should be used a lot more often. I was first introduced to this heating/cooling technique years ago from this very same channel. Unique living situations and alternate energy always pull my attention. – Is the touch screen reinforced against things dropping on it? – how are the teeth of the drive protected from sawdust ? what are the likelihood of skipping/jamming? – how do you move it by hand? Many times I can just eyeball things on the tablesaw. I don’t always know the measurement ahead of times. So yeah, Jay, I have a lot of skepticisms and questions. If you want super accurate repeatability what about something like Jer’s fence (google “jer’s woodshop incremental fence” and you’ll find it. But of course, that one is just plans and you need to build it yourself. But I suspect you could build that for a lot less than $800. No you wouldn’t want that. When we filmed this, we used a demo prototype that was set up to be more mobile. That being said we could’ve tucked the cord in between the tablesaw and the outfeed table but chose not to because of the location of the outlet and we didn’t want it to look like we were trying to hide anything. We filmed at someone else’s shop by the way so we made do with their set up. Yes it is. That’s the reason for it being recessed into fence. The rack is underneath the rail and so far hasn’t accumulated any sawdust. I wouldn’t expect any issues but if it did accumulate a TON of dust you’d just wipe it with a rag. There have been no issues of skipping or jamming, but just in case the fence is fitted with an encoder which allows it to “know” where it is at all times. It was designed with the same technology as CNC machines and as such has the same level of accuracy and reliability. There is a jog function where you hold your finger down on either arrow for left or right and it will move right along to where ever you want it to go. Rip It is one of the best new advances in wood working in a long time. Wow thank you for this! Hope to have you as a backer! You can get the same dead on accuracy and repeatability (repeatability of .002″ (.13mm) ) with a simple fence digital readout (wixey for instance). 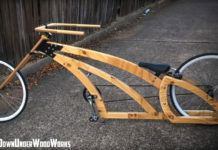 Yeah, you’d have to move the fence yourself, but you won’t have to deal with the cables, motors, gears and all the other points of failure, plus it’s almost 7 times cheaper. 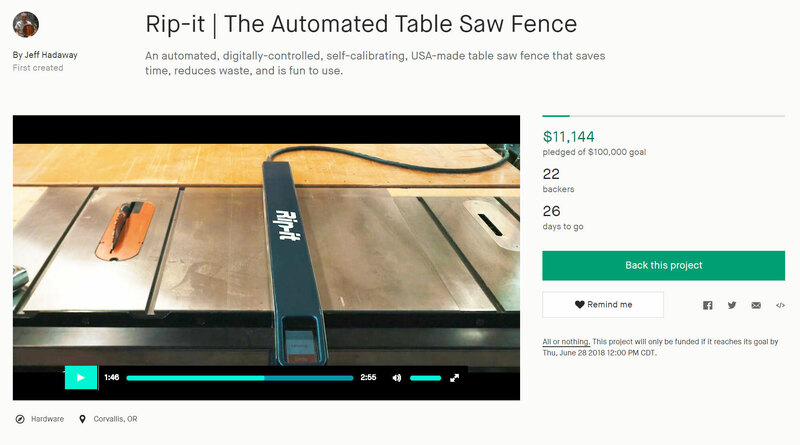 Probably even uses the same principle to measure the distance (measuring capacitance) and just moves the fence for you (for $700). Hey thanks for bringing these up. 1. Moving the fence yourself, even with a digital readout still takes 6 times longer. 2. There is one cord which tucks in between the table and the out-feed table. 3. We designed, engineered and built this as a one axis CNC machine. It uses standard CNC parts. The whole point of a CNC machine is that it is reliable. That fail points are rare. Rip-it is no different. The motor is standard stepper motor that arguably has a lifetime of use. The only real fail point is the pulley which would also last for decades. 4. A digital readout is cheaper. No arguing that. Just like a go-kart is cheaper than a sports car. They aren’t in the same bracket. 5. We do not use capacitance to measure anything. 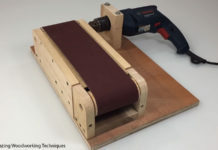 Rip-it knows where it is at at all times using a stepper motor and an encoder, just like a CNC machine. The Rip Fence really seems like an unnecessary device. 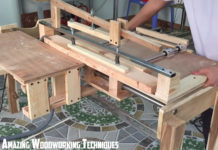 Woodworking, even fine woodworking, simply isn’t that hard to practice with the milling operations of a table saw. The fine-tuning of a piece happens after the piece is constructed of parts. This is done with other operations such as hand tools or simply with sanding for many. If this sort of precision is required (and I realize I’m harping on an ages-old argument in the craft here) then we already have the option of using Incra’s fence system or simply dialing in the cut after calibrating our saws or via a host of jigs or measurement devices. It’s just not that hard to do. We seem to have come to a place where gadgetry is seen as the answer to everything and shortcuts are the way to create fine pieces. For many (myself included), the journey is really the destination. Not that this is the end-all for everyone, but I think we have enough tools already to create beautiful and meaningful pieces. I see where you’re coming from on this. I’m a firm believer in not too much tech. I’ve heard of things like bluetooth enabled tea kettles or other random IoT devices. If there is one thing I can say about Rip-it, one feature, it’s that it gives you more time to do what you enjoy most: Creating beautiful pieces. Not tapping on a fence until it’s just right. Not fiddling with adjusting the gauge. Not locking it in, only to realize that in doing so you’ve moved it and it’s no longer in place. I think the standard fence has just been used for so long now that some people don’t realize just how much of a hindrance it really is. How much it detracts from the actual work.